Shading, or rendering, is one of my favorite stages of drawing faces. It is so rewarding to see your portrait become three-dimensional, and slowly come to life. Now that I have created a block-in for my drawing, I am ready to work with value. Before you begin adding value to your drawing, remember that your block-in is of the utmost importance. Take as much time as you need to make sure that it is accurate. You shouldn't have to make any drastic changes to the shadow shapes or structure of the picture during the value stage! Infographic on the Stages of Shading a Portrait! When you start drawing in the values, the initial goal is to cover the white of the paper as quickly as possible. Because you can only judge the accuracy of a value by comparing it to its surrounding values! If all that surrounds a value is the white of the paper, you will have no idea whether or not it is the correct lightness or darkness. So, after the block-in, the next step in drawing faces is to mass in the values. Although I covered a lot of area in this step, it was actually very simple. All I did was mass in three values: a value for the background, a value for the dark shape of the hair, and a value for the light shape in the hair. It is already beginning to look three-dimensional because of the very soft edge that merges the hair shape with the background: soft edges recede, and sharp edges come forward. I mass in the shadow shapes on the face with one or two values at most. I darkened the eye and nostril just so I don't completely lose the shapes. In this beginning stage of drawing in tone, I make the values even enough to compare them, but am not concerned with rendering. As I continue the drawing and notice what changes have to be made, I will have to modify the values, so it doesn't make sense to spend time beautifully rendering them at this point. I continue drawing in the general value masses. Here I have laid in an approximate value for the light shape on the neck. 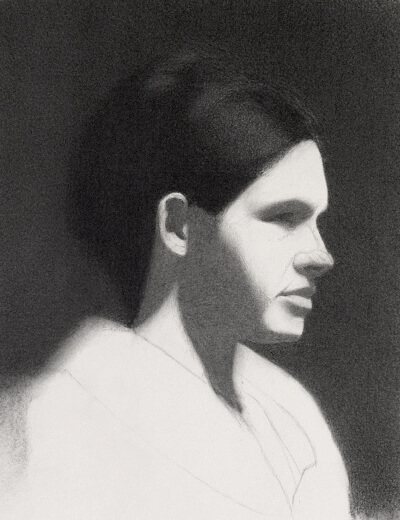 I have also worked on the shadow portion below the ear, softening the edge where the hairline meets the neck. Although this tutorial is about drawing faces, addressing the background and clothing can "complete the illusion". Treat the clothing as you would any other area of your drawing: by first massing in the general values. Once I have done this, I have reached an important stage in the drawing: the only area where I can still see the white of the paper is the light area on the face. I can now focus on comparing and modifying my values. 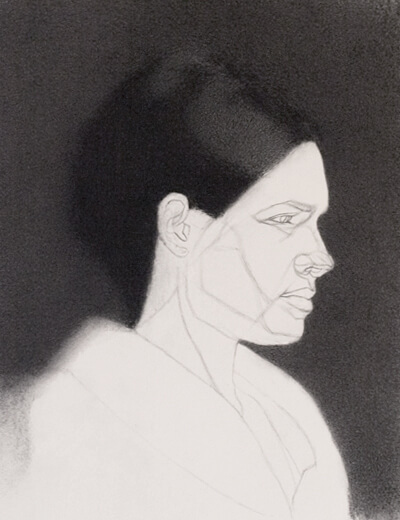 There are so many interesting tonal differences happening within the shadow shape on the face! There are two core shadows: at points A and C.
This is happening because there are actually two forms on the side plane of the face: the cheekbone area, and the jaw area, both of which can be thought of as egg-shaped forms (as I have indicated). The light is perpendicular to the form where you see the highlight on the cheek. It then becomes darker until it can no longer reach the form (this is the core shadow, or Point A). 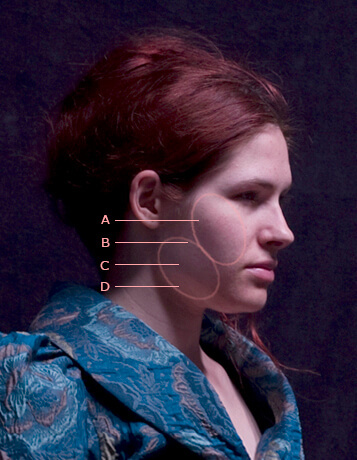 The form of the jaw then begins at point B. It catches a sliver of light from the light source before turning away at point C, which is the second core shadow. Point D is much lighter than the rest of the shadow due to reflected light. Light is reflected off of the model's chest, and bounces back up into the shadow under the chin. Before you begin developing the tonal differences in the shadow on the face, notice how much information is lost when you squint at the area. In order to create the illusion of three-dimensionality, you must preserve the contrast between the light and dark value families in your picture. To create enough difference between the "lights" and the "darks", draw only what you see when you squint! Notice how dark I made the reflected light in my drawing, even though it appeared to be so light on the model. Find and draw the "darkest darks" within the shadows on the face. In this case the darkest darks on the face are: the eye, the nostril, and just where the upper lip turns away and meets the lower lip. Begin rendering with a value or edge that seems easy and obvious to you. 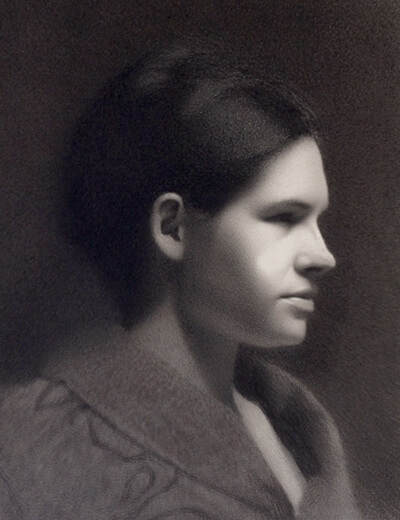 For example, I began shading by softening the edge of the hairline against the face. I then drew the gradation on the temple, from the shadow shape around the eye to the hairline. Some schools teach that you should begin rendering on one side of the face and shade until you reach the other side. While this is a perfectly valid method, I, personally, prefer to render different areas around the face. I draw the values that are most clear to me and work towards the more subtle ones. You can also work from dark to light. Perhaps that bottom lip. Furthermore, that value may be easy to draw accurately because I can compare it to the value of the shadow just below it, and to the upper lip. From the lip, I move on to rendering the chin. 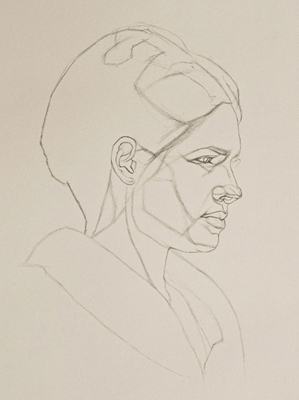 I also begin drawing the different edge qualities of the eyebrow, and from there, begin rendering the forehead. What is the lightest area on the face? Are there highlights on the face, and if yes, where are they? What is the sharpest edge on the face? What is the softest edge on the face? Is my eye drawn to my intended focal point when I look at my drawing? Remember to step back from your picture regularly when drawing faces. Looking at it from afar will help you to notice what is working and what is not. I want the focal point of the picture to be the face. When I look at my drawing, I notice that the face isn't attracting and holding enough of my attention. Instead, I notice that my eye quickly drops to the light shape on the chest. Referring back to the model, I realize that I have slightly overmodelled the face. Basically, the lights in the face are not light enough. The highlights in particular could be considerably brighter. This weakens the value structure, and causes the drawing to look less believable. This is a common drawing problem to watch out for, particularly when drawing faces. I have brightened the light areas on the face, and put in the finishing touches: the highlights on the nose and the lip. The clothing is drawn simply, so as not to distract from the focal point of the image: the face. And here is my finished portrait drawing! 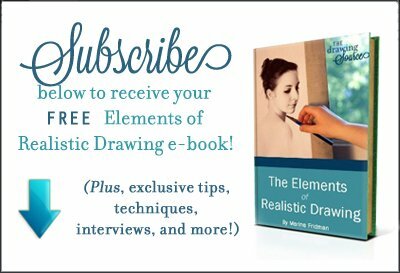 (and access to the Members-Only Drawing Resource Library)!